A combination hack-n-slash bullet-hell shooter, with a pixel-y art style and top-down perspective. Fullscreen recommended. Honestly as a fan of Realm of the Mad God this game isn't too bad, and the final boos is beautifully made. I managed to beat the game using only the starter staff, the starter sword, and absorption armor. 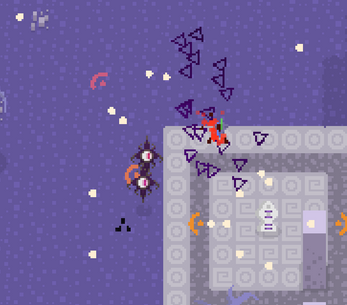 The basic mobs have a bit too little heath, while the turret guys have too much health and are easily dealt with using very evident safe spots. 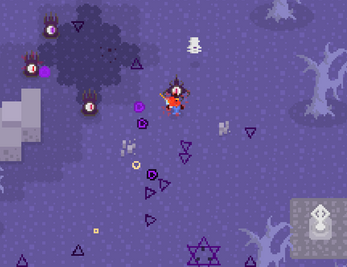 The bullet patterns feel very similar to Realm's own bullet patterns, and are very easy to dodge. The game is fun, but the enemies have questionably humongous health pools. There also seems to be a decent amount of lag especially at later portions of the game when there are many projectiles on screen at once. I really like it. I think the enemies are too powerful. Otherwise it's a good game. Thanks Anuke! Pretty smooth gameplay, I agree with the other comment about tweaking the health of the enemies.